Topic started 1 year ago by Remy in Featured Content. Since then 17 posts have been made by 8 users. Every month we put a U2 fan in the spotlight. The fan of the month for April 2018 is user phil_lebo. 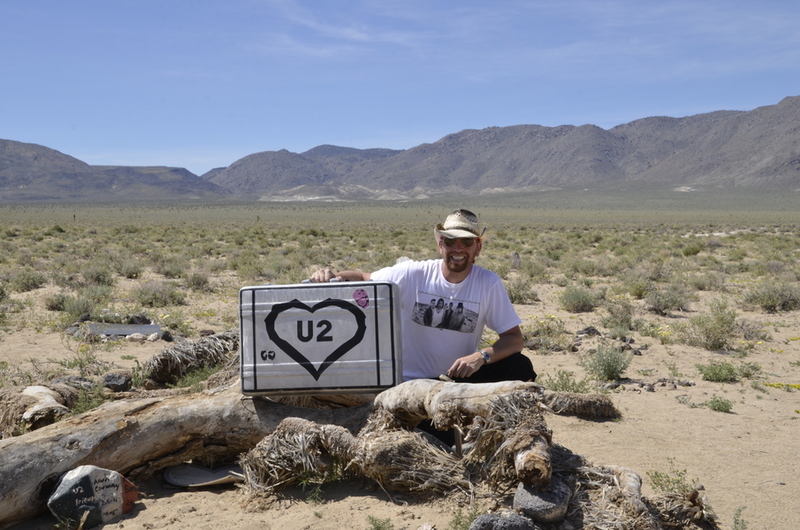 Read along for the interview we had with this U2 fan. "My wife and daughter have heard enough U2 to last them their lifetime." I am 44 years old and am originally from Brooklyn, NY. I currently work in outside sales and travel the United States quite frequently. Prior to that, I spent 10 years in the U.S. Navy on a nuclear powered submarine. Pretty exciting life back then, doing things as a twenty-something year old that most people could never imagine. After my service I went to school to become a chef. I worked professionally for a few years until the recession hit. I now live in NJ, with my (soon to be) 21 year old daughter and my wife that I've been with for ten years. experience that I'll never forget. I remember putting the CD in the car and waiting for the music to start. I was like, ?? ?, well as we know, Zooropa has that long intro that starts off really low. Finally it got going and I skipped that song. Actually skipped all the way to Stay and that was the first song I listened to on the album in its entirety. My collection is pretty big (according to my family at least, but I can always have more). 1. It started with posters, which I have about 20 - 30, including two 5'x4' posters, The Joshua Tree and one from Pop. I used to go around in college and ask people for their U2 poster if they had them, and usually they gave them to me willingly. World was a nicer place back then. 2. I have cassettes, CD's (including bootlegs), and vinyl. Right now I'm in the middle of collecting all the vinyl albums. Missing a few studio albums and a bunch of singles. 3. I have two Achtung Baby lithographs from the U2 website. 4. Concert memorabilia includes programs, sweaters, t-shirts, bags, ticket stubs, wristbands, etc. I make shadow boxes out of the wristbands, tickets and pictures to give myself a more unique piece of U2 history that is more personal to my experience. 5. A few newspaper clippings from the 90's. 6. 4 VHS tapes: Under A Blood Red Sky, Rattle and Hum, Achtung Baby videos and Numb. 7. Box sets: Joshua Tree, Achtung Baby, I&E and E&I. 8. (2) U2 comic books from the 90's. It was the Rock & Roll title and focused on different bands. U2 was two parts. 9. Various hardcover and softcover books about the band. Lots of magazines from the 90's around time of Zooropa. I go back and read these every now and then. 11. Just picked up this weekend, the U2 CD boxset, limited to 1000 copies, which just has a two track interview. 12. The favorite part of my collection though, is my own personal pictures of the band from all the concerts. I have hundreds (maybe thousands) of high quality photos from the shows that I print out and frame. Everything is in my office on the walls and bookshelves, and also on the walls in my garage. The vinyl is all framed and hanging in order along the ceiling in my office. My wife and daughter have heard enough U2 to last them their lifetime. You started seeing U2 live in 1992 for the ZooTV tour, what can you remember of those two nights in East Rutherford? I remember the first night they didn't play Sunday Bloody Sunday. The next night they did and the crowd erupted. That was the biggest moment from those shows. I also remember I was given tickets to both shows and didn't pay a penny for them. You have seen U2 over the course of 5 tours with a 6th one coming up, what was your favourite tour and why? Tough question. ZooTv was such a groundbreaking and amazing concert experience for the time, and one of the first concerts i ever attended in my life. But, the I&E tour was really amazing for me. I was in the RedZone for the second night which was the closest I've ever been to the band, and I got some amazing photos from that night. But, during the first I&E show two things happened. They played October for the first time in 25 years. I love that song and literally told my daughter the week before that I would never hear that song live. Well, never say never. Second, the performance of Bullet the Blue Sky that night was probably the best performance of a live song I have ever heard. I literally had chills going through me when they played it. It was just a very powerful experience for some reason that night. This is a toss up, and I'll tell you why. It would be cool to go back and see the early stuff in the 80's. Smaller venues, a band on the rise, cheaper ticket prices, lol. I would go back in time and go to the RedRocks show if I could. But, I missed the Pop and Elevation tours when I was in the Navy traveling the world. I would probably like to go back and be a part of those experiences a little more than I was. What is your favorite U2 bootleg, and why? Do you often listen to bootlegs? So to answer the second part first, I listen to bootlegs all the time. I often look to different tours for a specific song and then download that entire concert for that one song. So for example, the Vertigo Tour concerts with Discotheque and Kite in the encore were unique shows, which I have on my iPod. I look for different shows like that to keep it fresh and new. My favorite bootleg has to be the August 28, 1993 Zooropa show from Dublin. This show was broadcast live over the radio. I remember sitting on the floor of my living room in Brooklyn with a cassette player, recording the entire concert. I still have those two cassettes in my collection. Great concert and memories of listening to it live. I'm allowed to listen to other artists? lol. No one else has lasted as long as they have and has stayed as good, which is the key. The band has always pushed the limits of what a concert experience should be, constantly changing it up. I grew up on the hair-bands and then grunge. While those bands (Nirvana, Pearl Jam, Bon Jovi, NIN, etc.) had great albums, I could never get into their deep and rare tracks. I went to see the Foo Fighters twice on one tour, and both concerts were exactly the same. Green Day did the same thing, so it was very disappointing. U2 usually adds at least a different snippet every show. Their snippets really set them apart too. I cook all the time, constantly changing it up. In addition to being a chef, I also trained in baking and pastry, so I'm the best of both worlds in that respect. Photography is big for me, but unfortunately don't pursue it as much as I'd like. I've always been into Ford Mustangs, and have my 9th one now, a 1999 Cobra Convertible. I enjoy taking that out for rides in the spring before it gets too hot. Big into comic books, but don't buy new ones anymore. I have about 5,000 books, if not more, so no room to put anymore. But anything comic book related I'm in to, especially the movies which is making me re-live my childhood. Big Star Wars fan. Probably the only collection I have that is bigger than my U2 collection. Play golf when time permits. Football is big in our house, but starting to lose interest in that. Thank you for the opportunity and for making me the fan of the month. Looking forward to the upcoming tour and sharing all the pictures I take. Also, a very big thank you to you and everyone that makes this website what it is. I am on it everyday and and really enjoy everything about it. Thanks for this interview phil_lebo! Great read Phil, always interesting to read someone’s journey with u2. When Zooropa was released (...) I remember putting the CD in the car and waiting for the music to start. I was like, ?? ?, well as we know, Zooropa has that long intro that starts off really low. Finally it got going and I skipped that song. Actually skipped all the way to Stay and that was the first song I listened to on the album in its entirety. Thanks for the interesting read and insight into your life as a fan. Great interview! One question though: The favorite part of my collection though, is my own personal pictures of the band from all the concerts. I have hundreds (maybe thousands) of high quality photos from the shows that I print out and frame. Thanks for sharing your story Phil. Originally posted by LikeASong :One question though: The favorite part of my collection though, is my own personal pictures of the band from all the concerts. I have hundreds (maybe thousands) of high quality photos from the shows that I print out and frame. Lol, lots of wallet sized photos hanging. Originally posted by LikeASong :When Zooropa was released (...) I remember putting the CD in the car and waiting for the music to start. I was like, ?? ?, well as we know, Zooropa has that long intro that starts off really low. Finally it got going and I skipped that song. Actually skipped all the way to Stay and that was the first song I listened to on the album in its entirety. And we would all love to hear some of those songs live again, and not just Stay and Zooropa. Maybe throw in Lemon on this next tour or really surprise everyone with Babyface. Scrap Babyface and Lemon and just go all over DIRTY F*******G DAY!!!!!!!!! No need to apologize. Would love to hear Dirty Day again. Maybe play Some Days for the first time ever. Now I have to go listen to this album again and relive the 90's. I was thinking about Lemon the other day and I’d previously suggested an acoustic version with bono not doing the falsetto but I was wandering if they could pull off an electric version but again bono would have to sing much lower, I think it would really work. Stay, babyface, Zooropa and dirty day as mentioned above would also all be great.